molly moon's homemade blog: International Ice Cream for Breakfast Day! International Ice Cream for Breakfast Day! Molly Moon’s Homemade Ice Cream is encouraging Seattle’s ice cream lovers to celebrate International Eat Ice Cream for Breakfast Day on Saturday, Feb. 6 at both of her Seattle scoop shop locations. 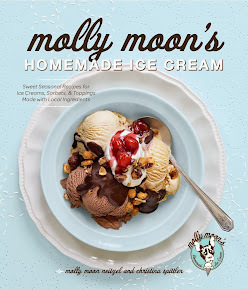 In honor of the ice cream-themed holiday, Molly Moon’s will be dishing up piping-hot bowls of Washington-grown steel-cut oats with a scoop of ice cream and toppings of your choice for just $6. Saturday’s total sales from both Molly Moon’s locations will be donated to Haiti health care and relief support non-profit, Partners in Health. For additional information about Partners in Health, please visit standwithhaiti.org/haiti. Last week Moon added Maple Bacon to her flavor lineup. Maple ice cream with candied, artisan bacon from Vashon Island’s Sea Breeze Farms pairs perfectly with a bowl of oatmeal. Organic and local toppings available include dried sour cherries, fresh berries, candied ginger, chopped hazelnuts and walnuts, chocolate bits, spiced honey, cinnamon, clove, cardamom and nutmeg. Each breakfast order also includes a glass of Seattle-based Juice Works’ fresh squeezed orange juice and, in Moon’s Wallingford shop, free cups of Vivace coffee. Moon’s oatmeal and ice cream breakfast tradition will be served from 9 a.m. to 1 p.m. Saturdays and Sundays through the end of March. For additional information about Molly Moon’s, please log on to mollymoonicecream.com. Thanks, Miss Moon, for planning such a great Ice Cream for Breakfast celebration! My grandmother, Florence Rappaport, invented this holiday in Rochester, NY about 45 years ago. Somehow it has taken on a life of its own and is now an International Phenomenon! My grandmother would have been absolutely thrilled that you are donating proceeds to Partners for Health. Your menu for ICFBD sounds delicious and I hope you have a fun and successful morning! I am in Philly but I wish I could swing by Seattle for your celebration! Saturday is the 5th. Do you guys mean to say that you'll be open Sunday, the 6th?